Realme is ready to bring its new smartphone. Chinese Smartphone manufacturer has announced that the new Realme U1 will be launched in India on November 28, 2018. 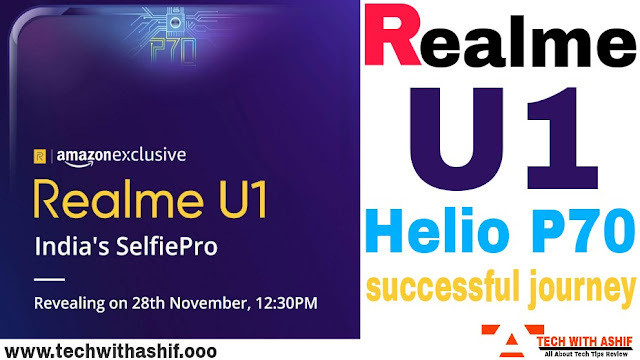 Realme U1 will be the world's first smartphone which will come with the latest MediaTek Helio P70 mobile processor. Realme U1 teaser company has released as 'SelfiePro'. It is expected that the smartphone will be powered with a strong front camera. The point is to note that Xiaomi is launching its redmi Note 6 Pro in the country on November 22. There is no information related to Realme U1 specifications yet. The phone can have a Helio P70 mobile platform and a strong selfie camera. Helio P70 is an upgraded processor of the last Halio P60 platform. It has upgraded technology to AI features and CPUs and GPUs. MediaTek claims that the latest mobile platform will provide superb performance, better camera features, faster connectivity and more battery life. Realme U1 will be an Amazon India Exclusive Smartphone. Realme U1 will be the company's first smartphone, with the Waterdrop Notch display. The company is calling it Dewdrop Notch. The smartphone is expected to run on the Android 8.0 orea operating system. Let me tell you that Realme has recently announced to provide an Android Pie update for its Realme 1 and Realme 2 smartphones. With Android Pie Update, both phones will find features like New System Navigation, Smart Text Selection, Re-designed Quick Settings, Easy Volume Control, New Dashboard, App Timer, New Do Not Disturb Mode and Wind Down.